When considering a printer, first look at the types of documents and materials you print regularly. Look also at what you may be outsourcing that you could produce in-house more efficiently if you had the right printing hardware. 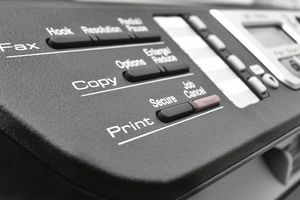 If you do a lot of printing in both high-resolution color and contracts and other documents in black and white, you may need to consider two different machines. When you consider printing speed as well as ink costs, sometimes two will be less expensive than one. When you're comparing the various brands and models of all-in-one printer scanner copiers, you'll see references to the duty cycle of the printer. This is usually the number of pages per month (or another time span) that the printer is rated to accommodate. If you under-buy, meaning buying a printer that is rated to print 2,000 pages per month and you're producing 5,000, then it will be worn out very quickly and be a maintenance headache until you get rid of it. Whatever you're printing today, pad it about 20 percent and get a printer that will accommodate the projected workload if you grow. This item fools users every day. Most detailed technical specifications will give you some kind of expected production capacity for the ink or toner cartridges. It will say that, at "30 percent coverage" (or some other percentage number), the ink or toner cartridge will produce a certain number of pages. What you need to know is that 30 percent isn't a lot of coverage area on a page, especially if you're doing color marketing pieces or other image-heavy content. It's very hard to estimate this by looking at a page, but just assume that you'll be using a significantly larger area than quoted in most cases. Duplexing is the ability of the printer to print two-sided documents automatically. It generally adds enough to the cost that many will drop this requirement to save money. If you never print both sides, such as in a marketing piece or newsletter, then it's probably OK to do without it. However, if you do two-sided print materials, generally it will be less expensive long-term to get duplexing. That's because the errors made by placing the first documents in the wrong way to get the second side to print correctly will cause ink and paper costs to rise over time.